POPA, Nicholas A. - age 89, of Fenton, died Sunday, October 14, 2018. Visitation will be held 4-8 PM Friday, November 16 at Sharp Funeral Homes, Fenton Chapel, 1000 W. Silver Lake Rd., Fenton; and 10 AM Saturday November 17 at Fenton United Methodist Church, 119 S. Leroy St., Fenton with a Memorial Service to begin at 11 AM. Memorial contributions may be made to Fenton United Methodist Church, Community Foundation of Greater Flint, or Fenton Rotary Club. Nicholas was born May 29, 1929 in Detroit. He married Donna Nygren on August 20, 1951. Nicholas attended Henry Ford Trade School and was a veteran of the U.S. Army serving during the Korean War. 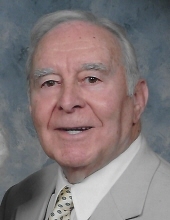 He was a resident of Fenton and passionate community supporter since 1956, with involvement in Fenton United Methodist Church, Planning Commission, Jaycees, and Rotary. Nicholas was most proud of his role in the development of the First National Bank of Fenton, Fenton Business & Technology Park, and Epic Machine. He was honored to serve as Grand Marshal of the 4th of July Parade. Surviving are: wife, Donna Popa of Fenton; two daughters, Debra (Gary) Teachworth of Midland and Janet (Cliff) Gardner of Horton; two grandchildren, Laura (Greg) Bugosh and Nicholas (Sara Stein) Teachworth; great-grandson, Nicholas Bugosh; sister-in-law, Barbara (James) Ganton; and many nieces, nephews, and cousins. He was preceded in death by: his mother, Anna; two brothers, George and John; and best friends, Robert Nygren and Richard Beardsley. He will be lovingly missed by his bride of 67 years, his family, neighbors, and friends. Tributes may be shared at www.sharpfuneralhomes.com. To send flowers or a remembrance gift to the family of Nicholas A. Popa, please visit our Tribute Store. "Email Address" would like to share the life celebration of Nicholas A. Popa. Click on the "link" to go to share a favorite memory or leave a condolence message for the family.